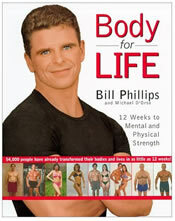 Bill Phillips’ Body for Life is an inspiring book that outlines a comprehensive diet and fitness program. The book continues to be a top seller worldwide, and has sparked a number of copy-cat programs. Body for life is about losing fat and gaining muscle – and having a diet that doesn’t leave you feeling tired or fatigued. The author Bill Phillips is inspired, passionate, motivational, and sincere regarding the program. He has recently added a new book Eating for Life – this primarily focuses on nutrition. This book has the basics of the Body for Life program along with a full color glossy cookbook full of meals and recipes that will fit the Body-for-Life style. The typical BFL diet consists of 5-6 meals per day. Portion size is emphasized rather than calorie counts. A typical meal might consist of one portion of protein, and one portion of carbohydrate. For one day each week you are allowed to ‘cheat’ and eat your favorite foods. The book provides lists of foods and sample meal plans – but you will need to plan carefully to follow the diet. The exercise program is essential to Body for Life. This includes 20 minutes 3 times per week of aerobic exercise, and lifting weights for 3 times a week (45 minutes per session). Bill Phillips has brought different elements together and combined them into a single program. He has delivered these in a truly inspiring and motivational fashion. Body for Life has been the catalyst for thousands of people to finally get fit and healthy, and there is always a Body for Life challenge going on somewhere in the world. The Body for Life program is sensible in all aspects. It is not a very low calorie plan, and has a substantial exercise component. Yes you will need to restructure your life to follow this (maybe that’s why its called Body for Life!). You will need to have considerable motivation to succeed, be prepared to work hard, and fat loss would be in the region of 1-2 pounds per week (if you are currently overweight). Despite the book being adorned with before and after photos of people becoming muscular, it takes a lot of discipline to not only lose fat but to build defined muscle mass. These exercises can be used with the Body for Life program. Following the diet (6 meals per day) can be difficult, and the author suggests (plugs?) supplements. This is not surprising as Bill Phillips was once the owner of EAS supplements (he subsequently sold the company on). EAS is reputed to be one of the superior supplement makers in the industry. Protein shakes (such as Myoplex) certainly have their place (particularly in a regime with 3-6 meals per day). Shakes, bars, and Ready-to-Drinks are a convenient way to supply your body with the nutrients – but are never a replacement for real food. This is a typical 1,700 calorie meal plan from the Eating For Life program. More low Calorie healthy recipes can be found here. See Also: Official site – The official site for Body-for-life products. If you do not work out as hard as they want you too in the book will you still lose weight? Yes. The diet is the main engine behind the weight loss. However, if you do not follow the exercise plan, you’ll need to scale back some on the food intake. This diet is great! I use it a few years ago and had great results and gained confidence and a love for exercising. I went from 187 to 145 and was incredibly fit, I even had a six pack!! The only problem was that I enjoyed exercising so much that I became a little obsessed with it and all of the benefits with this program stopped and I was unable to lose more and that made me quit altogether. If you follow his plan you only exercise about 45 minutes a day and that is ALL YOU NEED! The food is great because its not processed, you can get creative with it and you start to enjoy whole grains and lean meats as well as veggies, and even crave them! Another good note is that you get a free day once a week. hey i was wondering where can you buy the vanilla protein powder? please e-mail me back and tell me. Did you click on the links to shopzilla? You should be able to order it from a supplier there. I loved this program! It made me feel so good and healthy. It took planning since there were 5 – 6 meals per day but well worth the effort. I received compliments from both men and women because I looked so fit (not skinny). The greatest part was having 1 “cheat” day a week. However, you must stay strict on the other 6 days or it doesn’t work. There is also a book called Eating for Life filled with great recipes. This is the only thing out there that will actually work if you are trying to lose weight. I was a depressed, tired mom that was 5’1″ and weighing in at 170lbs. I was squeezing into size 14’s and completely mortified when one of my husbands employees asked who was the woman in our wedding picture! It was me before 3 kids destroyed my body….I read body for life and followed the food plan, which is not a diet, i ate more that I ever did. I also used weights in my home and walked a trail with my double stroller everyday, Only 4 months later I weighed in at 115 lbs and was wearing a size 5. I am now 107lbs and I wear a size 1. This book is well worth it. I look better now than I did before I had my kids. SOOOOO Worth It. THIS WORKS!This is the most well balanced and logical lifestyle change (because it needs to be more than a diet to work). It will change your body. But more important is how you exercise with this eating. It is amazing, the results. Not a fast, but amazing transformation program. I highly recommend it.